3 Skeins or Less Modern Baby Crochet is a collection of 18 baby garments, blankets and other adorable accessories (including a rattle). This collection includes designs from a number of well-known published artists: Brenda K.B. Anderson, Anastasia Popova, Janet Brani, A la Sascha, Kathy Merrick, Sharon Zientara, Cristina Mershon, Robyn Chachula, Terri. L. Keller, Lisa Van Klaveren and Katya Novikova. Each designs uses no more than 3 skeins of yarn. 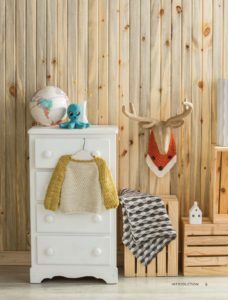 The Abbreviations, Glossary, Sources for Yarns used in the designs, Acknowledgements and About the Designers sections are included at the very end of the book. The Glossary includes written instructions and diagrams for the stitches and seaming techniques used. It does not provide diagrams, or additional information for attaching the zippers for the Dylan Hoodie or the Liam Zippered Pullover. Specific written instructions have been included within these 2 patterns to explain how to add the zippers (no diagrams, or photographs). The patterns are presented in written format using U.S. Crochet Terminology. Stitch Guides are included with each pattern to indicate any special stitches you may need to use – and how to make these stitches. Diagrams and schematics have also been included; along with stitch diagrams for the stitch patterns used. Applique Templates have been included for the patterns which show fabric or felt appliques (such as Octavia the Octopus). The Publisher has generously gifted us a Bonus Excerpt Pattern – for the Finley the Fox Bib designed by Lisa Van Klaveren (one of my favorite Designers! You may know her from Holland Designs). You can save yourself a copy below – remember my Printfriendly Button is located at the end of the post! The pattern is also in PDF format so if you want a copy of that you can also download it directly from the link in the pattern below. Excerpted from 3 Skeins or less: Modern Baby Crochet by Sharon Zientara Copyright © 2016 F+W Media, Inc. Used by permission of the publisher. All rights reserved. Photos courtesy of Joe Hancock. This foxy design is based on some gorgeous handmade fabric bibs that designer Lisa van Klaveren had for her girls when they were little. 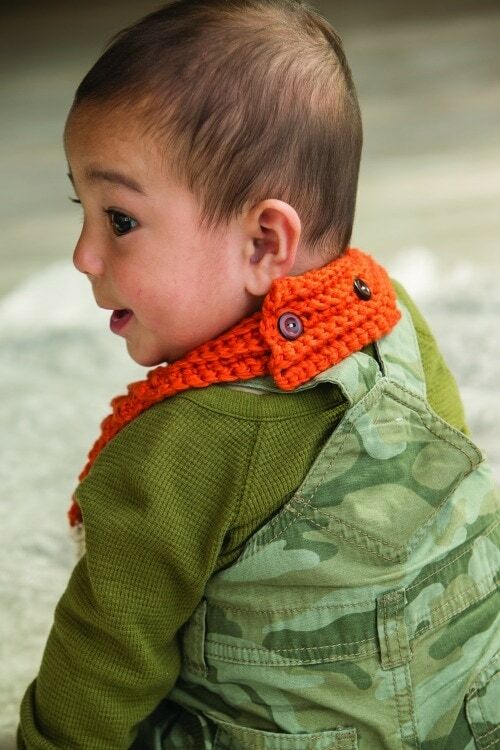 The adjustable neckline allows baby to keep wearing it as he grows! 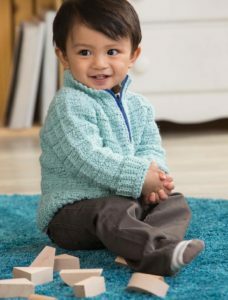 This bib features a ribbed collar with adjustable button closure at the back, so it will fit a little baby or an older toddler. Width: About 8″ (20.5 cm). Worsted Cotton (100% cotton; 150 yd [137 m]/31/2 oz [100 g]): #622 pumpkin (A), #80 bone (B), and #623 toffee (C), 1 skein each. Two ½” (13 mm) buttons; yarn needle; sewing needle; sewing thread. 15 sts and 18 rows = 4″ (10 cm) in patt st.
Row 1: Beg at neckline, ch 57 with (A), sc in 2nd ch from hook and in each ch across, turn—56 sts. Row 2: Ch 1, *sc blo in next 13 sc, 2 sc blo in next sc; rep from * across, turn—60 sts. Row 3: Ch 1, *sc blo in next 14 sc, 2 sc blo in next sc; rep from * across, turn—64 sts. Row 4: (buttonhole) Ch 1, sc blo in next 2 sc, ch 1, sk next sc (first buttonhole), sc blo in next 6 sc, ch 1, sk next sc (2nd buttonhole), sc blo in next 5 sc, 2 sc blo in next sc, *sc blo in next 15 sc, 2 sc blo in next sc; rep from * across, turn—68 sc, 2 ch-1 buttonholes. Row 5: Ch 1, *sc blo in next 16 sts, 2 sc blo in next st; rep from * across, turn—72 sc. Row 6: Ch 1, *sc blo in next 17 sc, 2 sc blo in next sc; rep from * across, turn—76 sc. Row 7: Ch 1, *sc blo in next 18 sc, 2 sc blo in next sc; rep from * across—80 sc. Fasten off. Row 8: Sk first 20 sc of Row 7 of collar and join (A) with sc blo in next sc, sc2tog in blo, sc blo in next 16 sc, [2 sc blo in next sc] twice, sc blo in next 16 sc, sc2tog in blo, sc blo in next sc, leave rem sts unworked, turn—40 sts. Row 9: Ch 1, sc blo in first sc, sc2tog in blo, sc blo in next 16 sc, [2 sc blo in next sc] twice, sc blo in next 16 sc, sc2tog in blo, sc blo in last sc, turn. Rows 10–19: Rep Row 9, joining (B) in last sc of Row 19. Fasten off (A). Row 20–26: With (B), rep Row 9. Fasten off. With (C), make an adjustable ring (see Glossary). Ch 1, 6 sc in ring—6 sts. Fasten off, leaving long tail to attach eye to bib. Rnd 1: With (C), make an adjustable ring. Ch 1, 6 sc in ring—6 sc. Rnd 2: [Sc in next sc, 2 sc in next sc] 3 times—9 sts. Fasten off leaving tail to attach nose to bib. sew in place. Sew second button 1 ¾” (4.5 cm) from first button. Sew eyes and nose to front of bib. Refer to photos for help with placement. 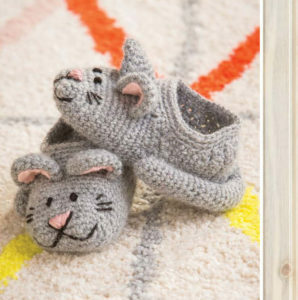 I have a new grandbaby coming in February and these designs are so cute!! These patterns look so cute & colorful. Thank you for the review. Lovely review of this new book. 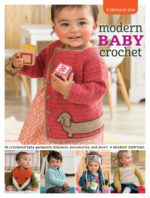 Friendly information about a nice new option for baby-wear patterns and idea. Thanks! Good looking collection of patterns! I love this book. 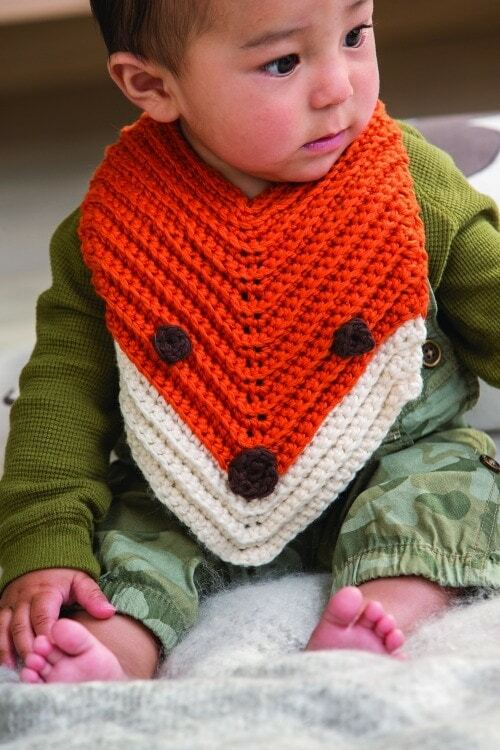 I just made the Finley the Fox bib for my great grandson. I want to make some of the hats and I love that most take 3 skeins or less. I want that dachshund sweater in my size! 🙂 Seriously though, I love how many of the designs in this book are more gender neutral. I struggled to find good patterns for my boys when they were babies. The dachshund sweater on the cover is adorable! This book looks awesome! I’m going to purchase it and get started on some items! Will definitely be back. Love this book! Awesome! 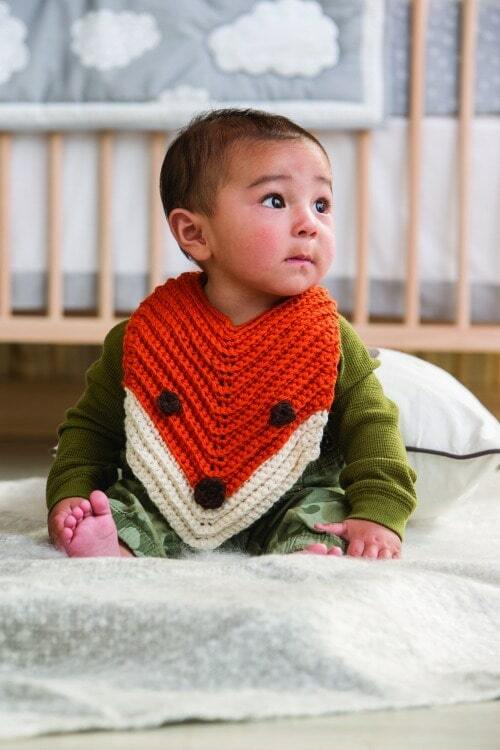 Love the fox bib! What a gorgeous fox bib, this book looks an awesome find!! One of my favorite to crochet! 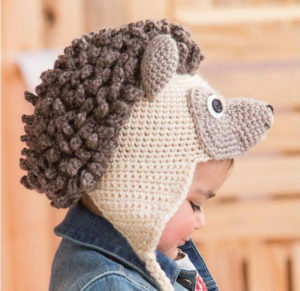 I love your baby crochet and baby items are my absolute favorite things to crochet. This looks like a great book I really love the blue sweater! This review is so informative. I love the list patterns that are in this. It’s great to be able to see what patterns are in the book before actually buying it. Makes it so much easier to decide whether or not I would actually use it. Thank you! I am most excited for the pull over zipper sweater. These patterns are amazing. Thanks for reviewing them and bringing them to my attention. Excellent book. I love all the different designs and that most patterns have instructions for multiple sizes. 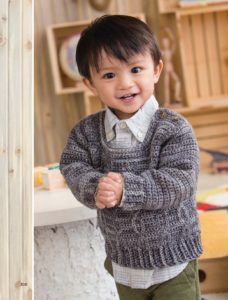 It is so frustrating to find a pattern that you love and no instructions for larger sizes. Wow such a variety! I’d love to make some of these for my friends kids and resize them for me too!! I think I might have a bit of trouble attaching the zipper without the extra help of pictures or something. I love some of the sweater designs and would love to adapt them to fit me! I love the variety of projects in this book. And the fact that they use 3 skeins or less is so fantastic. Now I can use great quality yarn while still keeping the project affordable! Hi Marina 🙂 Yes, Interweave Store does have International Shipping options available. You can see the specifics at the bottom of this page here: http://www.interweavestore.com/shipping-faqs#shippingcharge Hope this helps! They also have PDF versions available if you are ok with having an electronic copy of their publications instead of the paper copies. It costs the same as the book but you would not have shipping and handling too with the digital download. Hi! Do you know if they have worldwide shipping? I live in Argentina. Thanks!